It was fall of 2014. I was four weeks away from my college’s production of the play The Robber Bridegroom when I found myself in our auditorium filming one of the scenes for the movie Amelia 2.0, which is set to be released on Friday, August 4th, 2017. But my love for movie making didn’t start there at the filming, no. That was just a once in a lifetime experience. It started when I was a freshman in high school, reading biographies to play scripts, to thick “The making of….” with behind the scenes stills and cast member’s remarks, to the actual film schedule of one of my favorite Civil War movies, God’s and Generals. But what does all of that have to do with writing? You see, to make a good movie like God’s and Generals, The Chronicles of Narnia, and Amelia 2.0, you first have to do the casting before the filming process even starts. But before the casting, you have to have a script, and before you have a script, you have to have a story. And if you can guess by now, to have a good story, it first has to be written. Once that is done, and the story is chosen to be made into a big screen deal, everything else falls into place. Then once the filming starts you have the set and scene schedules that have to be written, you have to number or categorize the costumes, and such. So why do I love the excitement of filmmaking and watch the process of good movies come to the big screen? It's because I believe in the project, and from being part of a small scene myself a few years ago, I appreciate the “man hours” it takes to make a project of that caliber. It's the fact that the end project, the polished piece, that several thousands of people see on the screen and the responses, emotions, and how they react to the project, makes everything worthwhile. Even in a play, I had a glimpse of what the actors, actresses, directors, and the rest of the crew on any acting project go through to put an enjoyable piece of good entertainment together for everyone to enjoy. 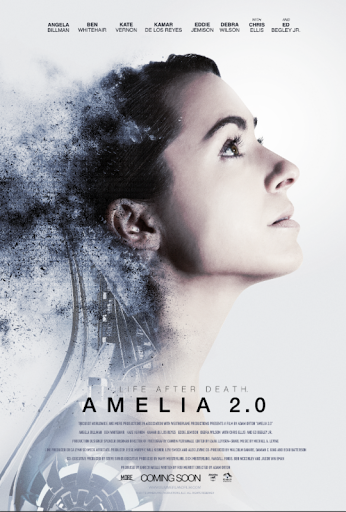 Now you may be wondering what exactly is Amelia 2.0? It's a sci/fi movie on robotic technology. After his wife Amelia suffers an aneurysm that leaves her bedridden and slowly dying, police officer Carter Summerland searches for a way to revive her. He's approached by Wesley Enterprises about allowing Amelia to be the test subject for an experimental program that will place her mind in an artificial body. It is ok to say "No"